Faulty feet and ankle structure profoundly affect leg length and pelvic positioning. The most common asymmetrical foot position is the pronated foot. Sensory receptors embedded on the bottom of the foot alert the brain to the slightest weight shift. Since the brain is always trying to maintain pelvic balance, when presented with a long left leg, it attempts to adapt to the altered weight shift by dropping the left medial arch (shortening the long leg) and supinating the right arch to lengthen the short leg.1 Left unchecked, excessive foot pronation will internally rotate the left lower extremity, causing excessive strain to the lateral meniscus and medial collateral knee ligaments. Most structurally oriented bodyworkers have learned hands-on routines for separating adhesive fascial bags of the 11 lower leg muscles to lift (or lower) dysfunctional foot arches. To insure proper foot functioning, tone must be stimulated in weakened arch muscles using fast paced muscle spindle techniques. As the myofascia regains lost elasticity, blood flow and vital nutrients permeate the fatigued tissues, allowing the muscles of supination (tibialis anterior, peroneus longus, tibialis posterior, etc.) to regain strength and mobility. In addition to myofascial work, one also must focus on restoring alignment and motion to the subtalar joint commonly stuck in a valgus (pronated) position (Figure 2). The subtalar or talocalcaneal joint forms the articulation where calcaneus and talus meet and allows foot inversion and eversion. To restore normal subtalar alignment, the therapist decompresses, abducts, plantar flexes and inverts the foot using myoskeletal contract-relax-assist (CRA) maneuvers. After successfully mobilizing the talus and calcaneus, all remaining ankle and foot joints should be systematically assessed and corrected. 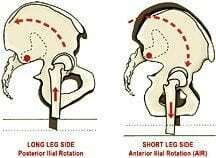 Ilial rotation is coupled with leg length discrepancy. In Figure 4, the femoral head on the long leg side “drives” the ilia upward and backward. Conversely, the ilium on the low femoral head side drops down (anteriorly rotates). The concurrent rotation of both ilia in opposite directions produces a left-on-left sacral torsion (Figure 5). This complex ilial rotation coexisting with sacral rotation usually is described as pelvic obliquity. Weight bearing on the right leg will produce this common compensatory pelvic pattern. Ilial rotation can be palpated by placing your fingers under each ASIS and shifting weight from one leg to another. Now place your thumbs on each sacral base and shift side to side. Right leg weight-bearing should cause the right sacral base to go deep (anteriorly rotate). Figure 5. Pelvic Obliquity (Adapted from A Quinn with permission). For efficient locomotion, a symmetrical and well-aligned body is essential. When the three bones of the pelvis are distorted by limb length discrepancies, gravitational forces wreak havoc on weakened SI joint and accessory pelvic ligaments (sacrotuberous and iliolumbar). These structures find themselves desperately struggling to maintain structural balance. Left untreated, a diverse array of symptoms appears as the SHORT leg destabilizes the pelvis by unleveling the sacral base. 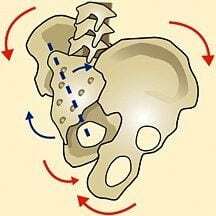 Painful lumbar compensations often travel all the way up through the atlantooccipital (A-O) joint, as the spinal column is forced to rotate and side-bend to accommodate the uneven sacral base. * Circumduction of the long limb. Walking on the toes on the short side and flexing the knee of the long side seems to be a fairly consistent compensatory movement pattern. As the center of gravity unevenly shifts, the smooth sinusoidal motion of gait is disrupted. Thus, the COSMETIC effect of walking also can contribute to the compensatory mechanism and eventual injury. For example, walking on the toes can lead to contracture of the Achilles and calf muscles, creating conditions such as Achilles tendinitis and plantar fascitis. Other functional scoliotic compensations include shortening of the quadratus lumborum on the long side, and a shortening of scalene, levator scapulae, sternocleidomastoid, and upper trapezius muscles on the contralateral side. This typical adaptive muscle imbalance pattern helps maintain erect head position with eyes level. Regrettably, prolonged muscle shortening “crams” vertebral and rib articulations, compounding the problem. The spine’s neuronal pool overflows as subthreshold stimuli progress to full-blown efferent nerve discharge, triggering increased muscle guarding. Thus, a vicious pain/spasm/pain CYCLE sinks its neurological tentacles deep into old intrinsic spinal groove muscles (rotatores, multifidus, intertransversarii and levator costalis), resulting in central nervous system overload, limbic system hyperactivity … and dis-STRESS. * Knee flexed on the long side. The IMPORTANCE of limb length discrepancy cannot be ignored and often is the key feature in lower limb and back pathologies. Thus, the use of proper visual and anatomic landmark evaluations is paramount in distinguishing between a functional and a structural limb length discrepancy. If in doubt about your ability to adequately and consistently distinguish leg length differences, have a three-dimensional radiographic postural study performed by a qualified manual medicine physician. Proper limb measurement is essential. Unfortunately, there is no single hands-on method proven completely reliable in its own right. It is for this reason that therapists should develop a holistic approach that includes systematically eliminating aberrant lower limb myofascial strain patterns while restoring joint play to all feet and ankle bones. Although presentations do differ from client to client, most of the previously discussed patterning theories will prove accurate. During the assessment phase, the most important feature for the beginning therapist to recognize is that asymmetry exists. From there, more specific details emerge with experience. Integral parts of treating the condition are identification, comprehension of each individual’s compensatory adaptations and their relationship to resultant symptomatology. Today’s touch therapist must be aware of the fundamental IMPORTANCE of limb inequalities, particularly the “short right leg” controversy featured in my next column.